[as] > AEC CAD/BIM > SketchUp 7.1 has landed! So what’s new in SketchUp? Let’s summarize what’s on this page. This is a major improvement to the way we can work with SketchUp. Apparently the developers replaced SketchUp’s display system with something much more efficient. Large models now handle better and if too much is being moved around visually, the view degrades and usability is preserved. This is happening concurrent to Google Earth’s rendering upgrades, making both applications much more responsive. My only (remaining) problem is that selecting lots of elements still slows down everything. This is a neat addition to the 3D texturing toolset. As you can see in the video above, facades can be identified from StreetView imagery and then applied as images to buildings. 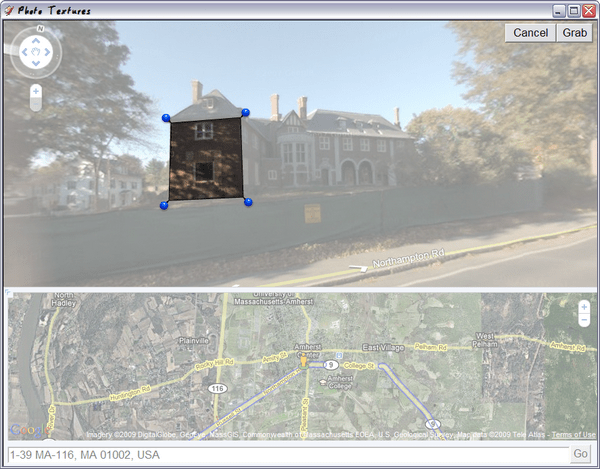 The main drawback of this tool is that in many cases, only portions of a building are clearly visible in StreetView (Amherst has 1 street in StreetView). However, the selection box placement tool is very sleek in the dialog – and much easier to use for novices than the classic “position texture” tool. It is now possible to upload a single component rather than having to upload the entire model. This basically removes the steps of exporting portions of a file into a clean file and then uploading that file. Easier is better! When modeling a city or a neighborhood, the user can now search for existing models in the 3D warehouse that are within a certain radius of the current position. This is useful for loading context models or for seeing what people have already modeled (to avoid duplicates). You can find an example for using this method in the file “webtextures_loader.rb” in the Tools sub-directory (starting at line 519). This will be very helpful for our lab installations. There’s nothing more annoying than having to click away the update notifier for at least 1/2 year. 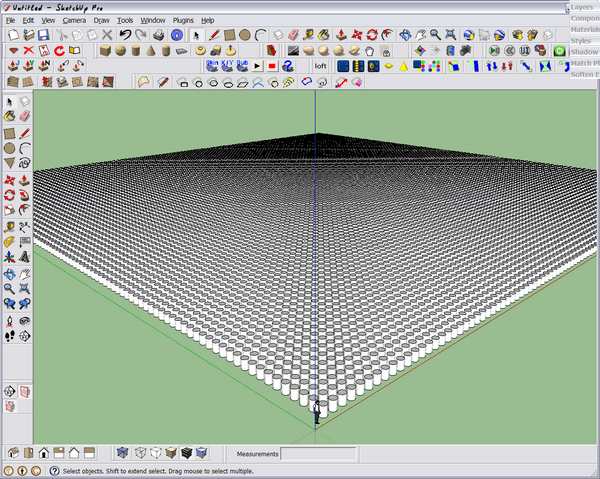 You can now use dimensions on your sheets (rather than only within the SketchUp model). To enable this, you can now also snap to the SketchUp model’s elements – quite simiar to how associative dimensions work in AutoCAD. With this final addition, SketchUp Pro is now at par for many users with much bigger and more expensive 3D modeling / 2D annotating software. Overall these are a lot of great new features that should help not only the 3D building modeler, but also the professional user of SketchUp. I also very much appreciate the new Product Ideas feedback system – something that was called for multiple times.